Australia’s gun enthusiasts aren’t particularly enthused about 3D printed plastic guns. “Any experienced shooter is likely to say – no thanks, I like these five fingers. And two eyes!” said Graham Park, president of the Shooters Union, which represents around 200,000 of the country's firearm owners. “In shooting circles they’re considered a joke because they’re so bad. No one wants one because most people are terrified they’ll blow up in their hand,” he said. Their fears are well founded. In 2013, New South Wales Police used a $1700 desktop 3D printer to manufacture two ‘Liberator’ guns designed by US firm Defense Distributed. In the first test, one of the guns had what police ballisticians called a ‘catastrophic failure’: it blew itself apart. In 2014, the UK’s National Ballistics Intelligence Service ran tests with similar results. In one, a piece of the gun ended up lodged in a ceiling panel. Defense Distributed’s Cody Wilson – who this month won a legal battle to put his firm’s gun blueprints back online – has called the tests “propaganda” and “convenient disinformation”. But firearm users in Australia are not convinced. “At present 3D printed guns hold no interest for 99 per cent of legitimate firearm owners, the one per cent being niche owners like collectors, or theatrical armorers,” said Kirk Yatras of lobby group Firearm Owners United. Recreational shooters and farmers want guns they can rely on and “use over and over again, not a throwaway” adds Park. But another major demographic of Australian gun users has embraced the technology with zeal: organised criminal gangs. Plastic printed weapons and the equipment to make them keep turning up in police raids, and more frequently here than in any other country, according to new analysis from QUT researchers. Within days of Dr Monique Mann and Dr Angela Daly from the university’s law faculty releasing their briefing paper 3D Printing, Policing and Crime this month, more guns allegedly manufactured using a 3D printer turned up in a raid on a suburban Sunshine Coast property. The most common 3D printers work by repeatedly depositing layers of molten plastic from a moving nozzle, until an object is formed. The process is called fused deposition modeling. Two types of thermoplastics are typically used, PLA and ABS. PLA is cheaper and more brittle, while ABS is stronger and more durable. Printers – which can be purchased for around $1300 or less – can manufacture objects from laser scans of existing objects, or from CAD files. Designs for guns are readily available on file sharing websites and the darknet. The machines and printed guns and parts keep showing up at properties raided by Australian police. In 2015 a police raid on a suburban Gold Coast home found 3D printed gun components which police later pieced together and fired. In 2016, a printer was seized at a property in Seabrook in Melbourne associated with an outlaw motorcycle gang. 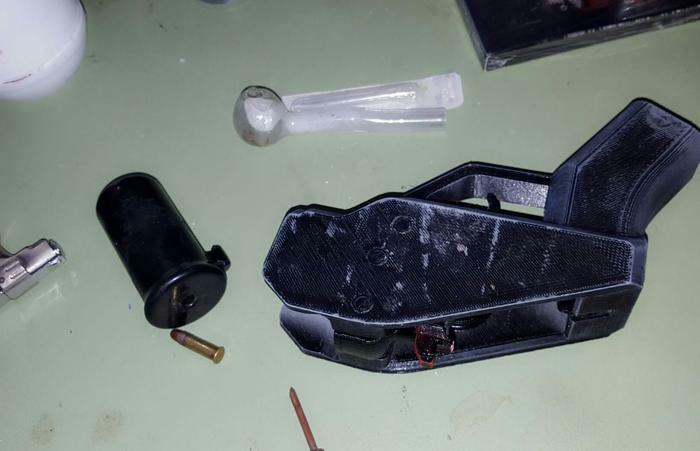 Later that year another printer was discovered at a property in Melbourne’s southeast with links to the Calabrian mafia, with three 3D printed firearms and knuckleduster found at another mafia-linked property two weeks later. Again in 2016, police raids on businesses in Nerang on the Gold Coast uncovered 3D printers and homemade automatic submachine guns. These are just some of the finds and discoveries continue. Firearms allegedly manufactured using a 3D printer were seized during a raid in the Sunshine Coast suburb of Mudjimba last week. Mann and Daly speculate that a number of factors unique to Australia are driving the high incidence of 3D printing among criminals here. Potentially, Mann says, “those elements combined may mean that it’s easier for someone to 3D print a gun than to obtain it through other means”.